Americas cup boat Madeline. This is my attempt at an already existing painting (now out of copyright). 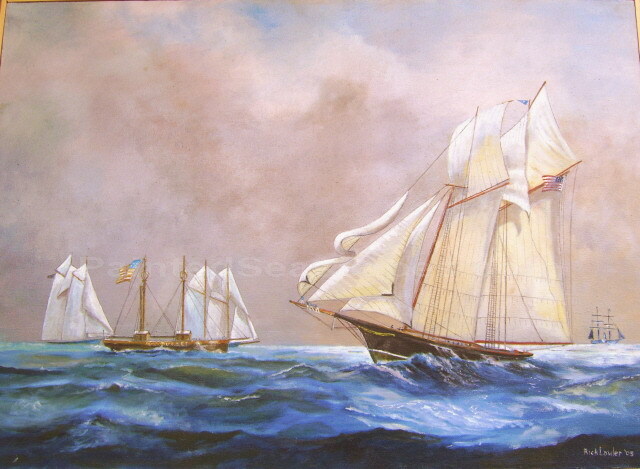 I just liked the way the artist originally depicted the luffing sails. This painting was fun to do, but was not my original idea. This was the third defense of America's Cup, in which America was successful in defending against the Canadian yacht Countess of Dufferin. 24" x 36" Stretched Giclee Print --- $250.00 . - "Paintedseascapes.com" watermark is not on the print. It is only on our photos for copyright protection.